This delicious, cheesy casserole is a great way to enjoy cauliflower, and it makes a wonderful addition to any meal, from everyday dinners to holiday feasts. The breadcrumb topping adds crunch and buttery flavor, but you can omit it or add toasted almonds for a lower carb casserole. Vary it a bit with a cup of steamed shredded carrots along with the cauliflower or use part broccoli in the casserole. Boil or steam cauliflower in a small amount of water until just tender, about 6 to 8 minutes. Drain thoroughly and set aside. Put the 4 tablespoons of butter in a large saucepan. Place the saucepan over medium heat and cook, stirring, until the butter has melted. Add the flour and stir until smooth. Cook, stirring constantly, for 2 minutes. Add salt and pepper. Gradually add the milk to the flour and butter mixture while stirring. Continue cooking the sauce, stirring, until thickened and bubbly. Add the mustard and cheese and continue cooking, stirring, until the cheese has melted. Add the drained cauliflower to the sauce and stir gently to blend. 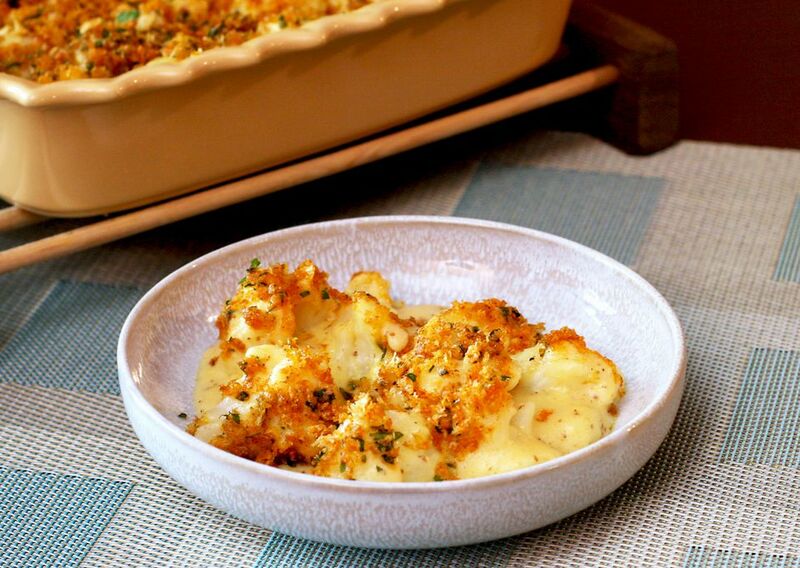 Spoon the cauliflower and cheese mixture into the prepared baking dish. Combine the soft breadcrumbs with the parsley, paprika, and 2 tablespoons melted butter; toss to blend thoroughly. Sprinkle the crumbs over the cauliflower mixture. Bake for 15 to 20 minutes, or until the casserole is bubbly and topping is lightly browned. Add a dash of cayenne pepper to the cheese sauce. For a richer sauce, use part light cream or half-and-half. Use a small head of cauliflower and add 2 to 3 cups of lightly steamed broccoli florets to the broccoli florets to the cauliflower and cheese mixture. Add finely chopped walnuts or pecans to the breadcrumb mixture. Replace the breadcrumb topping with 1/2 cup of toasted slivered almonds. To toast the almonds, spread them out in a dry skillet and cook over medium heat, stirring constantly, until they are lightly browned and aromatic. For a buttered almond topping, put 1/2 cup of slivered almonds in a microwave-safe dish with 1 heaping tablespoon of butter. Microwave the almonds and butter for about 3 minutes on 100% power, stirring frequently.